By far, one of my biggest struggles with a healthier lifestyle is avoiding snacks at night time. It's become such a habit for me that I don't know what to do with myself if I don't get to snack. There are so many reasons to avoid eating at night. Obviously it can cause weight gan and make it difficult for you to get a night of restful sleep. It can also cause acid reflux since when you lay down with food iny our belly it can spill out more easily. Plus late night noshing messes with your internal clock. So I put together a few tips for those of you that have struggled with this same issue. Sometimes when I start to get cravings, I remind myself that I could be dehydrated and my body just wants water. If I drink enough water, it really does seem to fill my tummy enough that I can quit obsessing over food. Sometimes it's sheer boredom that makes me start craving junk food at night so if I can find something else to do that takes my mind off it, I'm usually okay. Reading a book, looking through a magazine, playing a game on my iPad, or just tidying around the house helps a lot for me. Qurb™ Shot PM is a great way to help avoid late night snacking. It's been formulated to work effectively at night and doesn't contain any caffeine. It actually contains Theanine which has been scientifically shown to relax the body and mind. It contains ingredients that help reduce hunger and increase the level of two key hormones that regulate appetite. This shot was actually designed with a fast-acting delivery system to help burn fat and make you feel fuller longer. I just added it to my daily routine by taking it in the evening and I can't believe how much this along with the other tips above have actually put a stop to my cravings at night. Have you ever struggled with late night snacking? ? How did you overcome it? Great tips! I've never heard of Qurb Shot PM, but I'll have to give it a try! Such great advice. I'm definitely checking out Curb Shot PM. For sure!! let me know what u think of it then! I will use all the help that I can get on this. I swear, night time is the biggest culprit of overeating. I wish I were an early bird and went to bed at like 7 PM. if you try this stuff lemme know what u think!! I'm fine at night if I am not watching TV....but it seems once I'm sitting watching tv, I just want to nosh, it's terrible!! Since I'm on Weight Watchers, I have a bunch of healthy snacks in the house and lots of fruit, so if I really need something at least it's not too disastrous! That's my problem too lol its like watching tv and eating goes hand in hand in my brain. 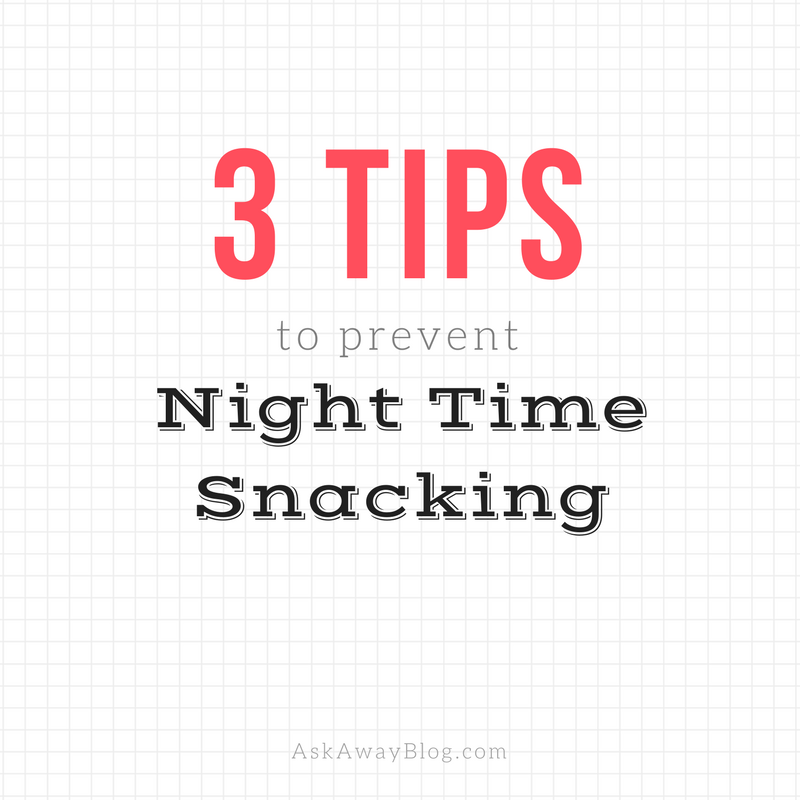 Drinking water & working out at night have helped me cut down on late night snacking a lot! Yep drinking water def helps me! Awesome tips! I'm definitely guilty of late night snacking! !